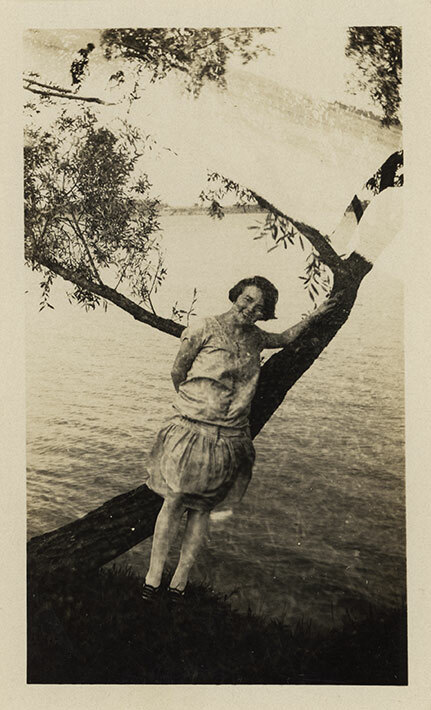 This is a black and white snapshot of Luisa Guagneli standing by a tree on a grassy embankment. There is open water in the background. Luisa is standing with her hands behind her back. She is smiling at the camera. She is wearing a light-coloured knee-length dress with buttons along the front. She has on black shoes and white stockings. Her hair is styled in the usual bob cut. This was taken on the same day as DICEA2011.0008.0012.